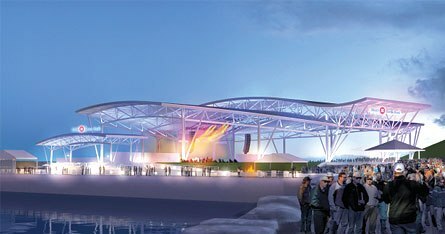 As promised, the BMO Harris Pavilion will be booking shows for post-Summerfest concerts. After all, it's a beautiful venue. The next show on the list is My Morning Jacket, and they perform this Saturday. The show starts at 7:30, and the opening act is none other than Band of Horses. For those of you who didn't make it down to Summerfest this year, the BMO Harris Pavilion is new to the grounds. It replaces the old M&I stage, right next to the Marcus Amp. This is not your typical Summerfest side stage. The pavilion is under cover, with assigned seats for nearly ten thousand people. The stage faces west, which means that your view of the stage has Lake Michigan as its backdrop. From what I have heard, it's an amazing view. There are 13 sections in total, with five sections that are just in front of the stage. Sections six through thirteen are set behind one through five. During the Summerfest run, there is room enough for folks to stand behind the assigned seats. The venue is set low, so those that have to stand in the back can see the stage with no obstructions. This is not a four season venue. Aside from the roof, it's wide open to the wind, rain, and Milwaukee winters. Given time, I'll bet that this venue becomes a favorite for those who head down to Summerfest. The last show of the season will feature none other than Elvis Costello. Costello plays on September 15.